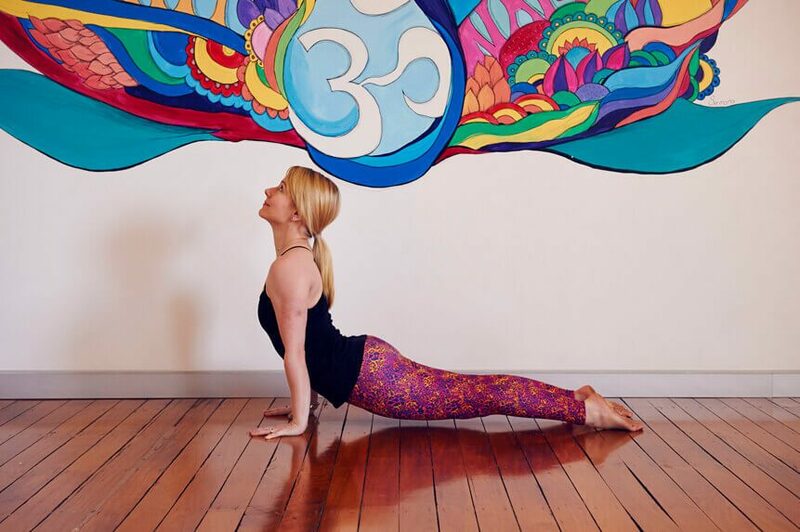 Yoga studio in Brisbane offering a range of vinyasa classes to suit all levels. Melinda has worked on [three] websites for me. One for a mining client and one for my yoga business. I cannot speak highly enough of her skills! She is communicative, friendly, incredibly creative, great value for money and delivers a high quality product within the agreed timeframe. If you are considering using Melinda for your website requirements, don't look any further, you've hit the jackpot! 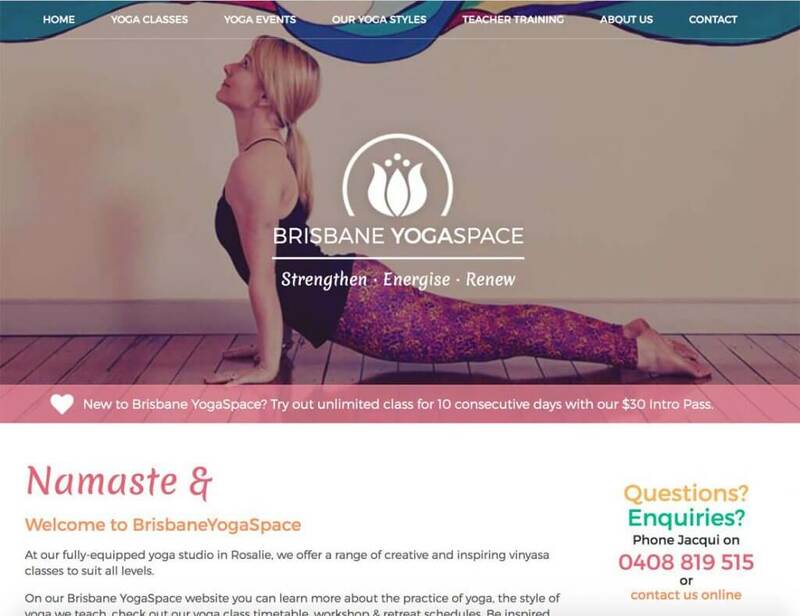 Keren and Jacqui, the directors of Brisbane YogaSpace, had an existing website and wanted a revamp. They wanted a branding and design revamp that was colourful in keeping with their studio atmosphere, and wanted to link directly to their MindBody yoga schedule on their website, to avoid having to remember to update class times in two different places. They needed to easily be able to update copy, add news, photos and manage their yoga retreats and workshop events. Keren was also keen on changing from their current .net site to WordPress as they found the old content management system difficult to use. After working with Keren on a number of other projects (including,Falmouth YogaSpace) I was extra keen to get working on this vibrant, fun website with an equally vibrant and fun client! During the design process I came up with a re-vamped logo for Keren and Jacqui – still using the lotus flower motif, but updated to look clean cut and serene. The layout of the website came together really easily thanks to the amazing photos Keren and Jacqui provided me with. 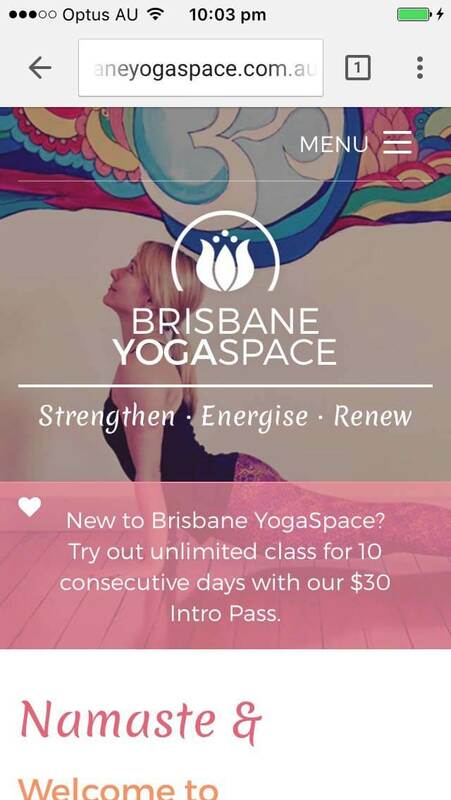 The Brisbane YogaSpace website is responsive, which means it works seamlessly on all device and computer screen sizes. Keren and Jacqui can update all the copy, sidebars and images on the website themselves, and create new content very easily through WordPress’ back end. Extra fields were coded into the Our Teacher template especially to make creating and updating their teacher details simple – no HTML knowledge required. 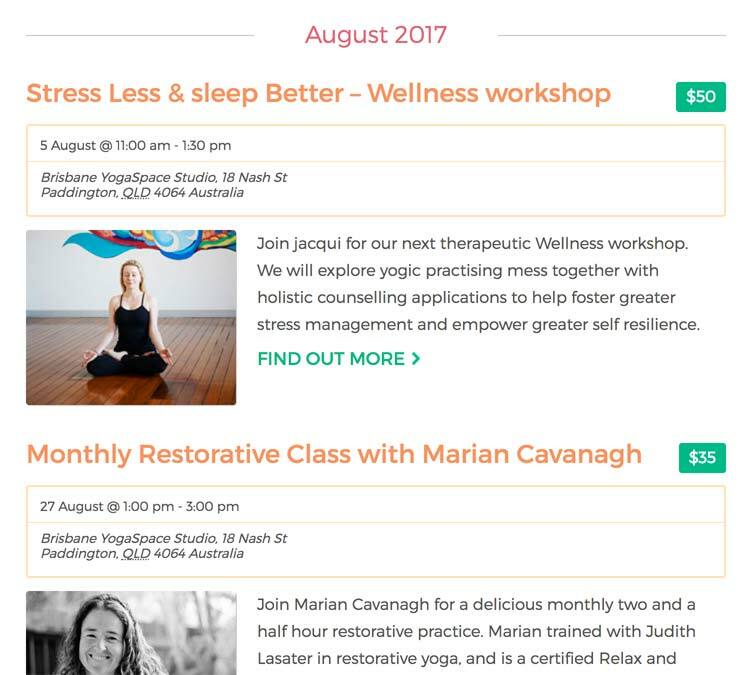 The Yoga Classes schedule is pulled in directly from their MindBody account, using a 3rd party Healcode integration, which means Keren and Jacqui can manage their classes and teachers in a way they are used to, take bookings via it, and it updates live on their yoga classes page on their website. 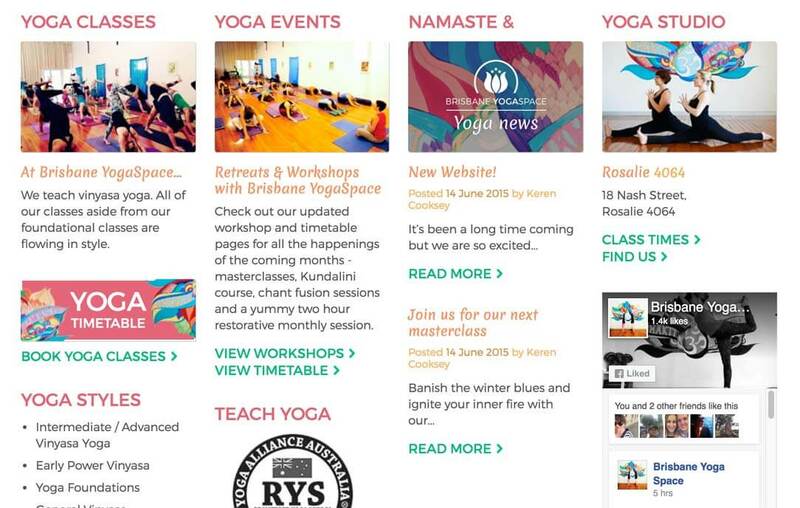 Yoga Retreats and Workshops have been integrated into the site using an Event management plugin, which displays beautifully with custom CSS to match their website’s style precisely. Jacqui and Keren can enter events using a very simple WordPress back end system – similar to adding a new page of regular content – and it will appear beautifully formatted on the front end once they publish it. The Facebook Like Box was also integrated using the standard Facebook API, to pull their Facebook page feed into the sidebar, and also display their like count in the footer. Several contact forms are built into the site, including the newsletter sign up at the bottom of every page. Each sends mail directly to their business email address. I love working with Keren and I hope I get to work with her again in the future. I love how the website turned out! BYS homepage; vivacious and professional. Scrolling down the homepage, each section of the website is laid out in an attractive and vibrant summary-style. 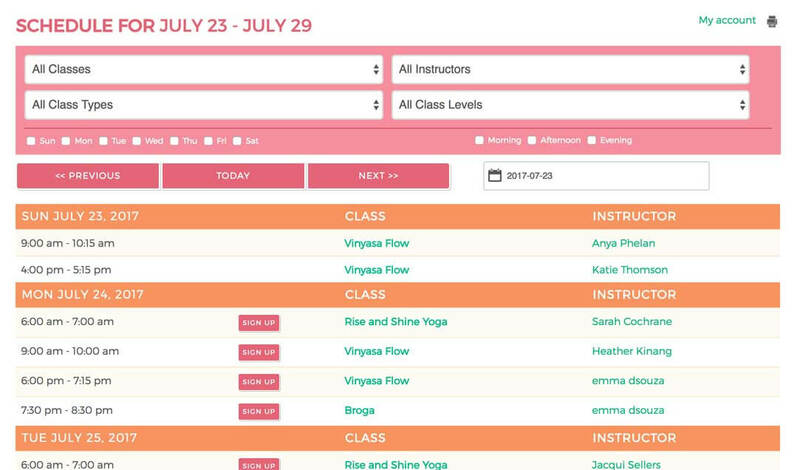 Brisbane YogaSpace's existing Mindbody timetable is embedded into the website. Overwrites were applied through CSS to ensure that the content pulled through from Healcode remained on-brand. BYS is fully responsive; this is the same homepage viewed from a handheld device. Events management included, meaning BYS can advertise their upcoming workshops and retreats in an informative and engaging fashion. Newsletter signup in the footer.